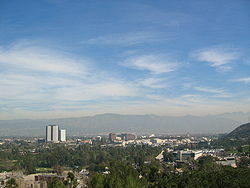 Burbank is a city in Los Angeles County, bordered by Glendale, Toluca Lake and San Fernando. Conveniently located with easy access, it even has it’s own airport, the Bob Hope Airport. Due to it’s close proximity to Hollywood, many media and entertainment companies have facilities in Burbank including Warner Bros. Entertainment, Warner Music Group, NBC Universal, The Walt Disney Company, ABC, Cartoon Network Studios, and Nickelodeon. Burbank is located in two distinct areas, a downtown civic center and residential neighborhoods nestled on the slopes and foothills of the Verdugo Mountains, and other neighborhoods north of the airport in flatlands at the eastern end of the San Fernando Valley.